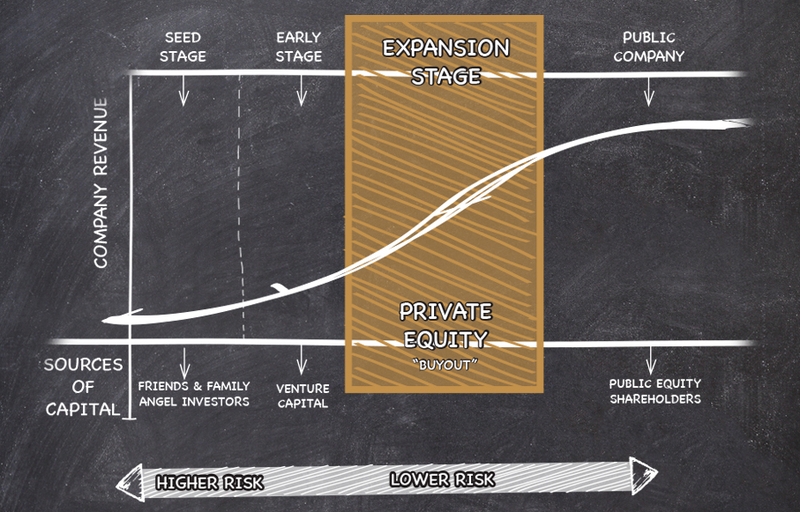 Home Key Topics What is Private Equity? Asset Class (low correlation, high alpha) – When compared to the public markets Private Equity tends to have lower correlation and higher alpha. Investment Style (active management) – Private Equity firms generally hold a controlling interest and have meaningful influence over the future direction of the company. Alternative to Growth Mutual Funds – Many savvy institutional investors think about Private Equity is as an alternative to mutual funds – as a way to diversify away from your growth alpha stocks in the public markets. On the far left, companies would receive a capital infusion from the likes of friends, family, and angel investors. There is a significant amount of concept and start up risk in this phase and thus, has the largest chance of failure. However, companies that made it past the seed stage can enter intro the early stage where venture capital funding is a frequent source of additional capital. Eventually companies advance to the expansion stage where there is an opportunity for Private Equity companies to partner with established brands to facilitate additional growth and position for an ultimate sale or listing. Sources: 1. http://www.investmentcouncil.org/app/uploads/pegcc18_aic-infographic_v5-2.pdf – January 31, 2017, Private Equity Growth Capital Council – Private Equity by the Numbers. 2. National Center for the Middle Market. Number of US Companies with at least $10 million in revenue. 3. Bloomberg View – “Where Have All the Public Companies Gone?” – June 24, 2015. 4. Investment Company Institute and Strategic Insight Simfund – ICI Investment Company Fact Book – 2014. 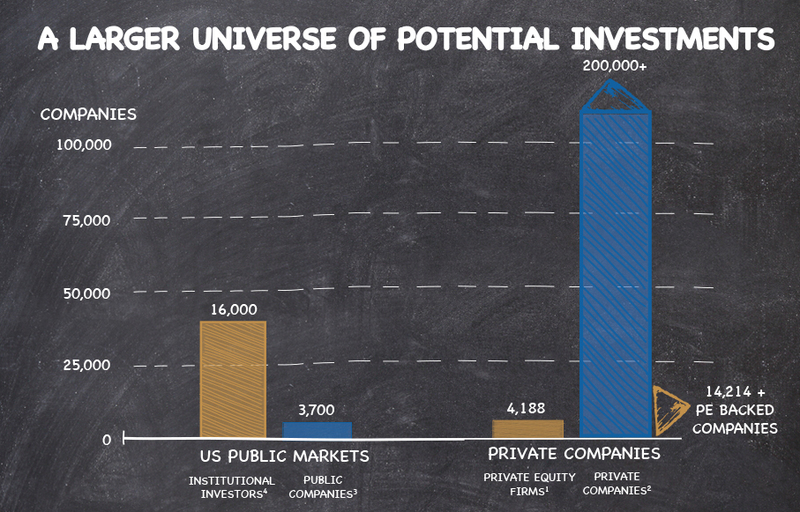 Private Equity firms are able to capitalize on the various inefficiencies associated with the public markets. The number of companies that are a suitable fit for a Private Equity investment is more than 200,000. That is where the efficiency game comes into play. In addition, there are no insider trading rules that apply to companies investing in private companies. Private Equity firms can discuss more information with management and can interview employees, vendors, and customers. Meaning they can have a more detailed picture of the company they look to invest in. Sources: 1. Cambridge Associates, U.S Private Equity Index and Selected Benchmark Statistics, September 30, 2015 2. www.multpl.com/s-p-500-dividend-yield/table, August 1,2016. This educational series, Alpha Academy, was named such because the main objective of Private Equity is alpha, plain and simple. Looking over 5, 10, 15, 20, and 25 year investment horizons, Private Equity as an asset class has consistently outperformed the public markets. 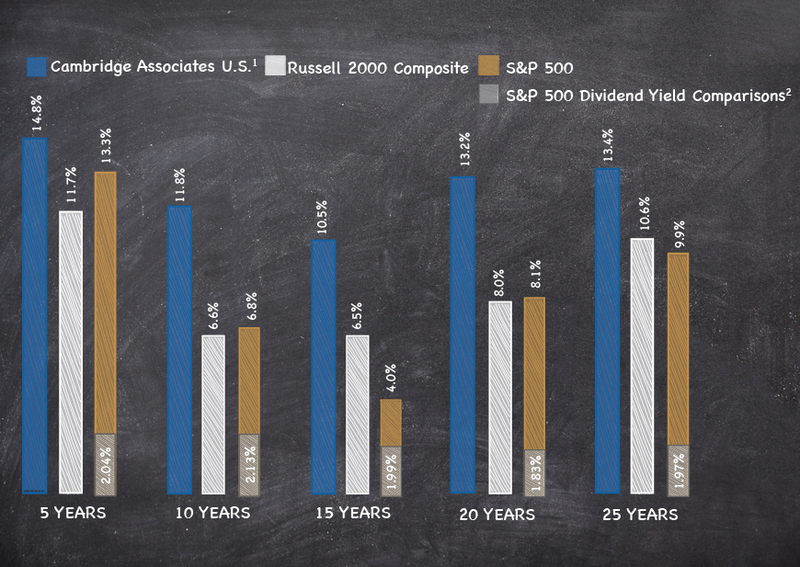 Once those differentials start compounding, the total return over a 20-25 year period can be 2-3 times greater.